(Bloomberg) -- Virginia Governor Ralph Northam, in his first interview since a racist photo in his medical school yearbook emerged over a week ago, said he'll finish his four-year term in office and use the time to pursue an agenda of racial reconciliation and "equity." Northam spoke to reporters from the Washington Post for 30 minutes on Saturday in the formal front parlor of the 1813 Executive Mansion in Richmond, Virginia. Separately, Northam's deputy, Virginia Lieutenant Governor Justin Fairfax, is under increasing pressure to resign over allegations of sexual assault. Northam said he's asked his cabinet secretaries to come up with specific proposals to begin addressing issues of inequality, such as expanding access to health care, housing and transportation, and to begin reporting those suggestions on Monday. "It's obvious from what happened this week that we still have a lot of work to do," he said. "There are still some very deep wounds in Virginia, and especially in the area of equity." "It has really raised the level of awareness for racial issues in Virginia. And so we're ready to learn from our mistakes," Northam said. Northam, 59, told his staff Friday he won't resign. He maintains that he's not in the yearbook photograph of one person in blackface and another in Ku Klux Klan robes. The governor couldn't explain why he initially took responsibility for the photo on Feb. 1 -- only to reverse himself within a day -- other than to say that he was "shocked" when he first saw it on an iPhone. Meanwhile, Fairfax faced two allegations as of Friday from women who came forward in recent weeks to accuse him of sexually assaulting them in 2000 and 2004, respectively. Fairfax has denied the allegations. 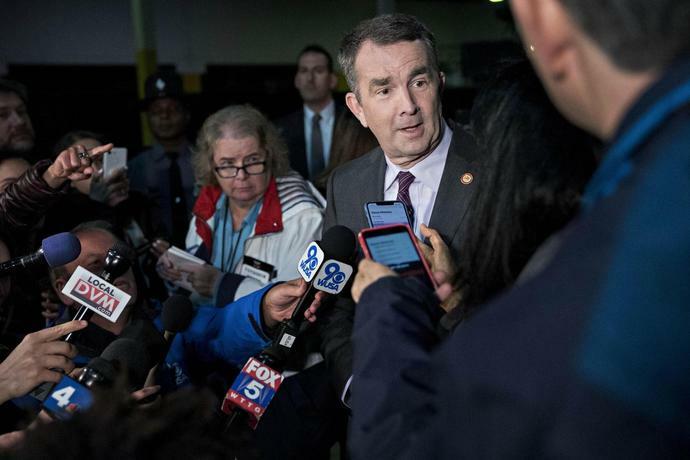 Republicans, including President Donald Trump, have predicted the scandal plaguing Virginia's top Democratic officials will give them the opportunity to make political gains in a state that's increasingly voted for Democrats in recent elections. Democratic U.S. House members from Virginia have called on Fairfax to resign, as have Democratic senators Kirsten Gillibrand of New York and Cory Booker of New Jersey -- both 2020 presidential contenders. One Virginia state legislator, Democrat Patrick Hope, said he's planning to introduce articles of impeachment against Fairfax if he doesn't resign. On Friday, the Democratic Lieutenant Governors Association removed Fairfax from its leadership ranks, naming officials from Delaware and Washington state in his place. --With assistance from Erik Wasson and Meghan Genovese. Volodymyr Zelenskiy, a 41-year-old TV comic who's tapped into fury at the political class, will comfortably defeat incumbent Petro Poroshenko at a runoff on Sunday, according to opinion polls. "People are disillusioned with the old elite, which hasn't proved itself after the revolution," Yuriy Yakymenko, an analyst at the Razumkov Center for Economic and Political Studies in Kiev, said by phone. "Zelenskiy positioned himself as a populist politician opposed to the old authorities. For Lyft Inc., whose stock has tumbled sharply since its March 28 launch, it took less than three weeks for disillusioned shareholders to sue the company over claims they were taken for a ride. Such lawsuits are a rite of passage for newly public companies, and have become even more common after the 2008 financial crisis, according to Cornerstone Research. Lyft was accused in two nearly identical complaints filed April 16 of exaggerating in its prospectus when it said its U.S. market share was 39 percent.